This report displays the expected cash flow (Credit / Debit) of the organization. The report is executed according to selected inner accounts. The cash flow report is essential for the organization future financial decisions making. From / Till Date - Select the required time frame for the report. As default, the report displays the following three months. 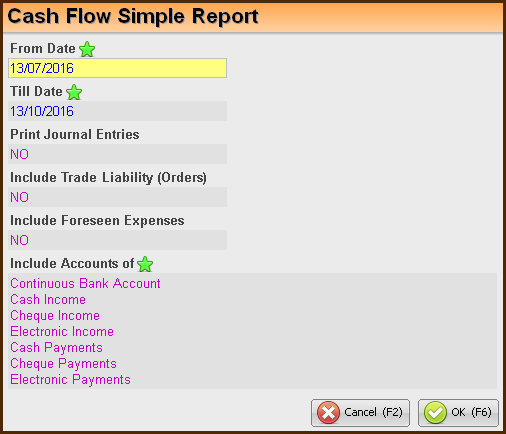 Print Journal Entries - define whether to display the journal entries of the cash flow (credit and debit) in this report. Include Accounts of - In this field, the list of inner accounts is displayed. As default, all of the accounts are marked as selected. This table displays the opening balance for each of the selected accounts and for the required dates. The total balance of the accounts is displayed at the bottom. Entry Number For each of the included bookkeeping entries, the entry number will be displayed. Description For each of the included bookkeeping entries, its defined description will be displayed. Cash Flow Date The actual date of the cash flow. Credit / Debit In these fields the cash flow values will be displayed accordingly. Calculated Balance This field displays the calculated balance of the displayed transactions. Please note - The value of this field is a progressive summary of the previous transactions. Balance This field displays the calculated balance of the inner accounts, according to the cash flow.